Increase your Critical Star Drop Rate by 10.5%. Increase Buster Card performance of all allies by 20% while on the field. Decreases party's debuff resistance 20% [Demerit] while she is on the field. One of the Alter Egos created from BB. The Alter Ego of Love and Hate. A girl whose greatest impressions are her large breasts and fiendish claws. she has no choice but to retaliate. Amongst the Alter Egos, she is the most prominent power character. Wrapping, twisting, and shutting her targets into her breasts, a persona of a monopolizing blind courtship... Should have been the case, but due to a certain encounter, she realized such a one-sided courtship was bad and changed her ways, becoming more wary of the potential damage caused by her body's numerous deadly weapons, growing as a reticent but gentle-hearted AI. "1..1 tonne is just a kind of burden during transmissions, and is not my actual weight!" She has a bad habit of retreating into a shell and placing the blame on others (surroundings) whenever things don't work out. In CCC that characteristic...wholeheartedly, being unable to approach others...had been displayed in the form of a stalker but, recognizing her mistake and flaws led to a suppression of her stalker traits, and she began aiming towards "properly putting in effort, and properly making friends". However her laziness (as long as she has a reason, she'll begin to slack off) is still the same, and she has become cognizant of it as a problem, working hard to correct it. She cannot perceive the actual shape of both her hands. Her "mind" causes her eyes to avert her ugly form, leading it to translate her hands as those of a normal girl. She could only see her claws as "something normal". Once, Lip could not understand "why was she feared", but now she has started to properly face her body, accepting her monstrous nature. 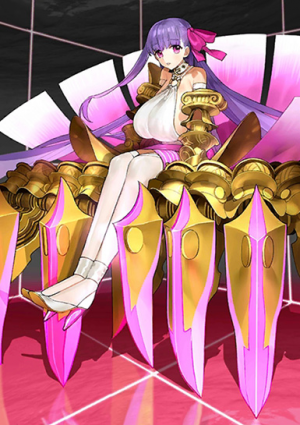 "Even if Death Do Us Apart"
The Noble Phantasms of the Alter Egos are illegal modifications of proper ones, and the servant used as her resource is from the 'Volsung Saga', the valkyrie Brynhild. A spear of love-hate swung out of vengeance against her husband Sigurd, who betrayed, and tarnished her name. 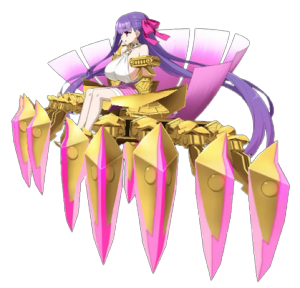 Passionlip's Noble Phantasm carries the same attribute...the deeper the love for the other party, the stronger its power...was what it held, but that's a story of the past. Formerly called by the heart as "Until Death Divides the Two Apart", a wish has reformed it "Till death parts the two". Parting will definitely come. It doesn't deny love even in breakup, even in betrayal. "No matter what parting comes, as long as the love held is true, I believe it is eternal." Following Lip's wishes, it became a power not to hate her loved ones, but a power to to protect them. Truly a pure and innocent yet mature holy maiden power. An artificial servant created through the fusion of multiple mythological essences. She carries the elements of Parvati, Durga, and Brynhild. A function to temporarily store, and deposit unnecessary datafiles. Same as a trashbin. 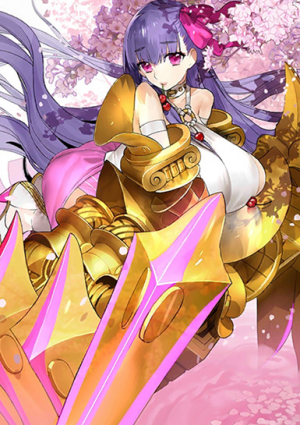 In Passionlip's case, for some reason the icon has been configured to the middle of her chest. To be frank, it is an imaginary pocket-space that can store countless amounts of trash. 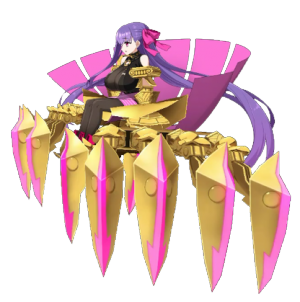 As long as it is dust data crushed by Passionlip, it can endlessly store all kinds of capacities. At one glance it looks convenient, but because the dust data can no longer be returned to their original state, it is an absolutely meaningless function. 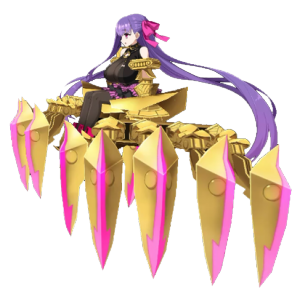 But as Passionlip is someone who suppresses her emotions within, a self-destructive type of girl, it can be thought that this is why she attained such a unique physique. 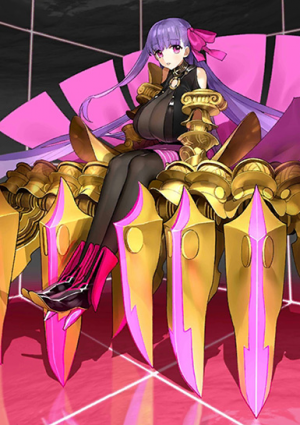 In CCC, falling once into this valley of death meant being unable to ever climb back out, but in FGO, there is the chance of scooping out the contracted Master. In group battles, the target's hostility (hate) centers on her, increasing her probabilities of being attacked. id_es. A cheat skill evolved from Monstrous Strength. No matter how big the volume, things "grasped" in her hands can be crushed, compressed by her claws. Things that have been compressed are turned into a 1 cm quadrilateral cube but, the mass can only be lightened to 1/10th of its original. Compressed things are thereafter treated as dust data. Compressible things are limited to anything smaller than Lip's hands is not the case, as anything in her viewpoint that can be "gathered in her hands" are treated as such. Though it is a planar, physical interference that ignores laws of distance, larger things will definitely take time to be compressed. A trompe-l'œil-like compression technique (codec) unique to digital space. 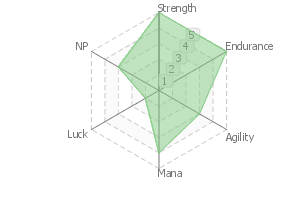 Lip's specialization is in destruction, and has a greater destructive power than BB when it comes to stationary targets...terrain, or buildings. Most importantly when it comes to servants or Masters, escaping from the quick-to-sense-danger Lip's vision -> turns into the outcome of the slow-witted Lip not giving chase. 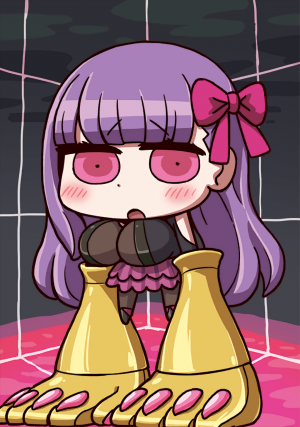 In contrast to Metlilith who is "a girl who falls in love with love", Passionlip was "a girl who seeks love". However from that appearance that never received love, love turned into hate as it was never attained no matter how much it was sought after. 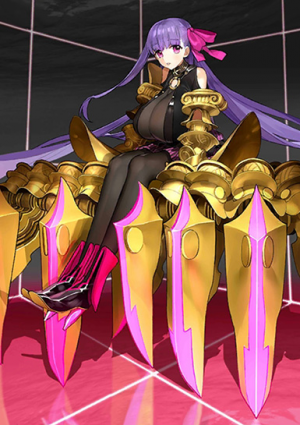 The Alter Ego of Love and Hate, Passionlip was born that way but, the present Lip no longer has any of those shadows. In the first place she had an honest personality, and after changing her heart, her personality became slightly closer to becoming a girl "that was the foundation of BB". Lip is aware of how she is a servant with malicious and troubling functions. For that purpose, she is grateful towards the Master for not abandoning, and continuing to stay with her. That gratitude will turn into affection and longing, and eventually she will surely dream of love. ......however, the Lip who is aware of her upbringing and traits, can no longer "innocently seek for love". Should she fall in love, and be loved, this gentle person will eventually be hurt. That's why dreaming of love like this, and becoming the Master's strength from the shadows is what she worked hard towards. This page was last modified on 15 February 2019, at 07:33.